In the “The Process of Transition”, we talked about managing the psychological impacts of change. We talked about how change is inevitable, as are the emotional consequence of change. So how do you negotiate the waves of change for your own, and others’, benefit? In the post, Tactics for Leading Change, I made the argument that a Leader’s most effective long-term tool is that of influence. Influence, while being a less direct route to making change, has a much larger impact. The tool shown here is modified from Stephen Covey’s “Circle of Focus” first described in The Seven Habits of Highly Effective People. The Circle of Focus contains anything whose behavior you can directly control. This includes you, your dog (possibly), your small child (before they begin walking, maybe), and, for a very short time, anyone who you are able to exercise direct power and authority over. I say a short time, because if you have to exercise direct power and authority for long periods of time, you are likely engaged in a power struggle which can tend towards dysfunctional, passive-aggressive behaviors. So, lets say that the Circle of Focus contains, essentially and most functionally, you. The Circle of Influence contains anything that you have some degree of, well, influence, that directly affects you and thus warrants you exercising your influence. Typically, you must work with others in this circle – you can’t effectively get the outcome most beneficial to you without the help of others. Thus, we spend much of our time in the Circle of Influence. Finally, the Circle of Concern contains everything that concerns you, but that you don’t have any control over. There are times, particularly in the short term, when it is important to realize those things – that realization can bring a lot of relief. IE, your children may do what they do; the polar bears may die; China may soon take over the world in carbon; etc. 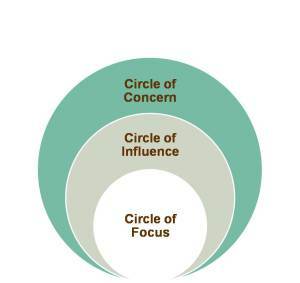 The trick to this circle is to expand the Circle of Influence into that Circle of Concern. Thus, much of change is about helping individuals, companies, governments, non-profits, know that they CAN do something that will positively impact the world around them. There are books and books written on how to “Increase Your Influence NOW!” and “Be a More Influential Person!” They describe mainly tactics – not fundamentals – for increasing your influence, including trading favors, complimenting the right person, putting your best foot forward. And while these tactics may be helpful when used wisely, they are like dust in comparison to a person who is filled with integrity and character, whose results and competence are trusted, and who shows discernment in how they exert and increase their influence. So, how do you expand your Circle of Influence? Here are a few fundamentals. Know Thyself.The fundamental lives on. Knowing your strengths and weaknesses, seeking feedbackand making appropriate changes, knowing your values and vision for your personal life is where you have to begin. Starting from there, you will attract people and build respect because of your clarity. Be Trustworthy. If you say you are going to do something, do it. Live to your commitments to yourself and to others. By doing that, you build trust which you can draw on when you need it most – making a change for something you believe in. Exhibit Competence & Follow-Through. Trust does not come without Respect. Let me repeat – Trust does not come without Respect.In our intellectually driven, outcomes-oriented culture, respect comes when people show they “can get the job done.” Doing whatever it takes to be really, really good at what you do, whether it is developing skills, exhibiting willpower and perserverence, or being clear about what you can and can’t do, delivering results based on competence and character is the fastest way to build respect. I am a huge fan of a book written by Stephen Covey’s son, Stephen M. R. Covey, called The Speed of Trust. There, he talks about how business happens much faster – and I would add that change happens much easier – when there is trust. He also discusses how people can build their own “trustworthiness”, through exhibiting character, integrity, competence, and results, and gives some keys to developing trustworthiness yourself. Highly recommended read. Back to change. A leader who wants to make a fundamental change – whether or not this leader has authority – can do so by weaving a wide web of influence. Building trust amongst your community (professional, personal, and everything in between) builds your influence. In a sense, you have built up, over time, the slow way, a sort of “Influence bank account.” Stephen M.R. Covey goes so far as to call it a “Trust Account.” So how do you spend it? Choosing your battles. In this world, discerning which battles are worth taking on is an important one. Battling everything and everyone to get your way (or the way of a select few) can pay off if there are results. But if the strain of the risk is too great, and it doesn’t “pan out” (a reference to the might risky business of panning for gold) it can actually break down people’s willingness to follow you when they most need to. You have to spend it to make it. Building “social capital” by making introductions, helping people out, taking risks on changes you and your team believe it actually builds trust not only in your team, but also in the organization at large. Because you arechoosing your battles, you develop a reputation for taking thoughtful risks – and when you believe strongly that something needs to change, people will pay attention because of that. Keep your eye on what’s best for the collective, and make sure it stays there. As soon as people know that you are promoting self over the collective, they will begin to question your motives. If your “trust account” is high, that is not a big deal, particularly if you are transparent about it. But the greater the change you are proposing, the greater the need for a large “trust account”, and the more you need to keep an eye on promoting the collective over the self.